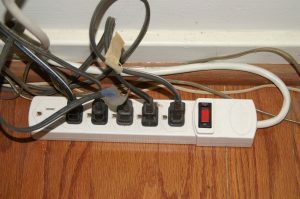 The most indispensable item a college freshman can bring for their dorm room is a power strip. With dorms in Madison leaning more towards a ‘tiny’ description, new students should expect that outlets will be limited. Power strips are absolutely essential in anyone’s life. But as a college freshman, they’re priceless. By bringing one for your freshman year, you’ll be able to heat up leftovers in a microwave at the same time as curling your hair. In addition, you can avoid the awkward roommate struggle of sneakily unplugging each other’s appliances in order to use yours. So, not only is a power strip essential for multitasking, it is an essential tool in insuring your roommate’s friendship for as long as possible. Lastly, by thinking ahead with this essential electrical chord, you’ll be the envy of your freshman peers. Those without strips will be amazed at your expert use of electricity at Madison. Also, you won’t have to deal with the hassle of going to DoIT during your first week to fight for the last remaining power strips. Instead, you can focus on joining that new student org or hanging out at the terrace, all with a charged phone. In conclusion, a power strip is extremely necessary for a freshman to thrive. It’s many ports will aid you in multitasking, reduce roommate drama, and help you to avoid hassle in the future.